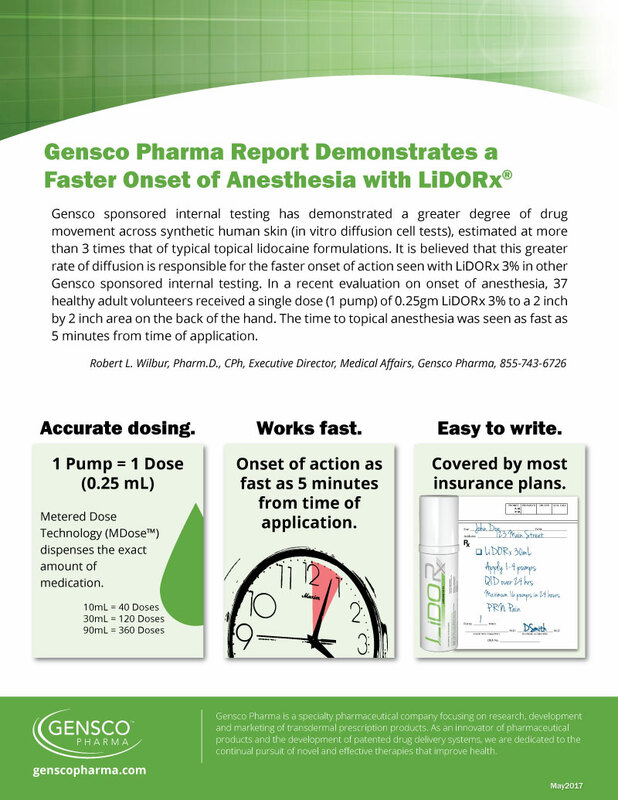 LiDORx®, formulated and manufactured by Gensco in a FDA licensed facility, contains 3% lidocaine hydrochloride (30mg of lidocaine HCl in each gram of gel) in a patented transdermal delivery system. The transdermal delivery system enhances the absorption of the lidocaine across the skin barrier yielding a much greater effect (topical anesthesia) than other prescription formulations including those containing 5% Lidocaine as clinically proven by the LiDORx Activation Study. LiDORx® is an effective topical anesthetic best used for minor to moderate pain relief. LiDORx® can be applied as needed over 24-hours unlike the patch system that must be removed after 12 hours. LiDORx® Size 10mL NDC 35781-0300-1 0.33 fl oz. (10mL) equivalent to 40 doses. Apply 1-4 pumps QID over 24-hour period or as directed by a physician. Maximum 16 pumps over 24 hours. LiDORx® Size 30mL NDC 35781-0300-3 1.01 fl oz. (30mL) equivalent to 120 doses. Apply 1-4 pumps QID over 24-hour period or as directed by a physician. Maximum 16 pumps over 24 hours. LiDORx® Size 90mL NDC 35781-0300-9 3.04 fl oz. (90mL) equivalent to 360 doses. Apply 1-4 pumps QID over 24-hour period or as directed by a physician. Maximum 16 pumps over 24 hours. Onset of action as fast as 5 minutes. 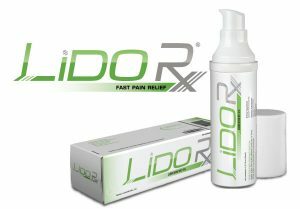 LiDORx® provides topical non-narcotic temporary relief for pain as prescribed by a physician. LiDORx® (Lidocaine HCl USP 3%) applied in controlled doses provide relief of surface pain and utilizes MDose™ Technology which dispenses the exact amount of medication (0.25 ml per pump) per application. 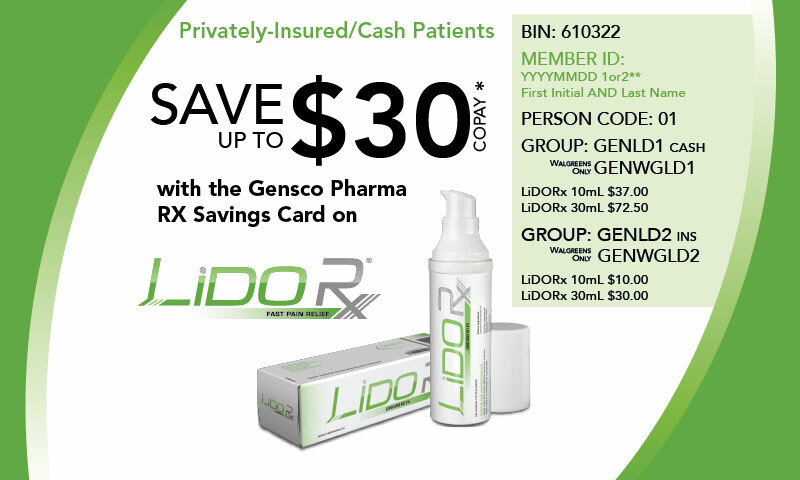 LiDORx® is only available by prescription. LiDORx® contains lidocaine hydrochloride formulated into a patented transdermal gel that is designed to enhance the penetration of lidocaine HCl through the skin into the affected tissues. Since LiDORx® is not a patch, it can be applied in varying amounts, within package insert guidelines, to even difficult areas including joints, back, neck, legs, and arms regardless of bony protuberances or motion. In addition, peripheral neuropathies have been shown to benefit from topical lidocaine application. 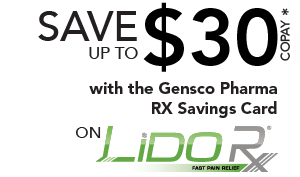 All Gensco products, including LiDORx®, are distributed to pharmacy chains such as Walgreens®, CVS®, Walmart®, RiteAid®, Kroger® and Publix® through the major wholesalers such as McKesson, Cardinal and AmerisourceBergen. LiDORx® is contracted with DAPA (Contract #SP0200-15-H-0003), Federal Supply Schedule (FSS), making it accessible to all military personnel and is also available to all MEDICARE patients (Medicare Contract #P1466). LiDORx® is available through these Group Purchasing Organizations (GPOs): Intalere, Innovatix, MedAssets, Premier, MHA, ROi and Vizient. This offer is not valid for prescriptions reimbursed under Medicare, Medicaid, or any other federal or state program, or where prohibited by law. Where third party reimbursement covers a portion of your prescriptions, this coupon is valid only for a portion of the amount of your actual out-of-pocket expenses. Offer valid only for prescriptions filled in the United States. Affordable Medication Solutions reserves the right to discontinue this offer at any time. This offer cannot be combined with any other rebate or coupon, free trial, or similar offer for the specified prescription. The discount will be accepted only at participating pharmacies. by Robert L. Wilbur, Pharm.D., CPh.